Sushi with cucumber and smoked capelin caviar "Flower"
Суши с огурцом и подкопченной икрой мойвы "Цветок"
Суші з огірком і підкопченою ікрою мойви "Квітка"
I wanted to make a classic Kappa Maki — eat sushi with cucumber and put them in the form of a flower — I saw this interesting little idea on the Internet. But in the process of sushi formation new idea came to me, in my opinion, turned out beautiful. 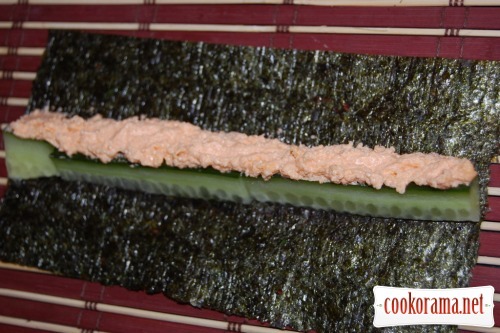 Therefore, it is no longer Kappa Maki, but some other Maks The recipe is not for the competition, but just to a romantic theme of the February recipe directions: serve this edible flower to your loved one, will be pretty good, as for me. 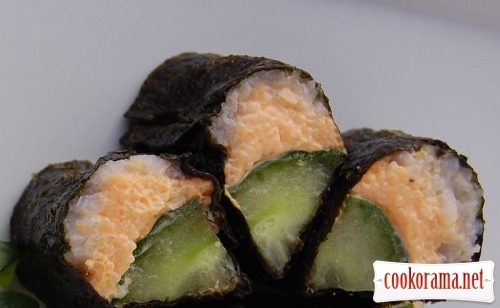 Cut nori in two parts. Prepare rice traditionally: wash rice for sushi in several waters well, to stop coloring of water. Take for 1 glass of rice 1,2 gl of water. Bring rice to boil and boil for 15-17 min. Rice should absorb all water. Leave rice with closed lid for ​​15 min. Next, slightly stir with rice vinegar. 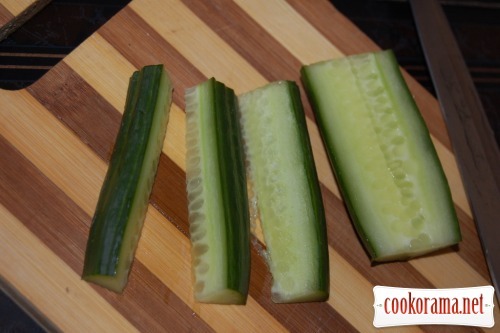 Cut cucumber along in 6 similar segments. 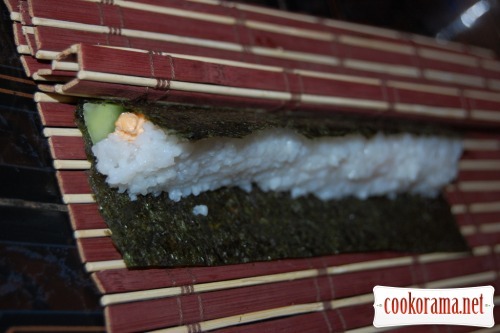 For 1 roll you need 1 segment at all length of nori. 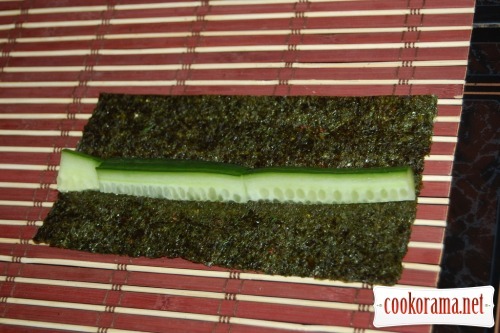 Spread cucumber in the middle of nori. Put caviar from side of cucumber peel. 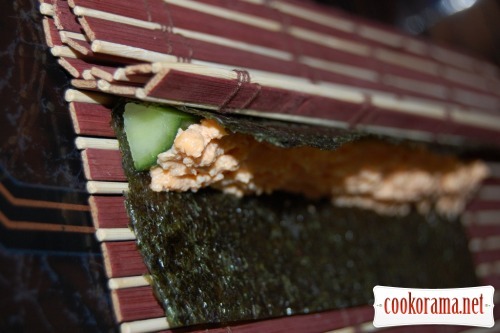 With the help of a bamboo mat wrap nori tightly on the cucumber. It turns out a triangle. Spread on caviar rice evenly. 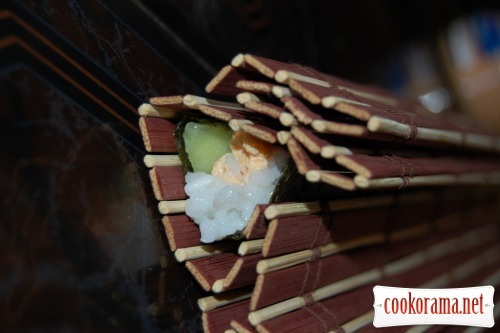 With the help of mat bend empty nori edges on rice, forming a «drop». 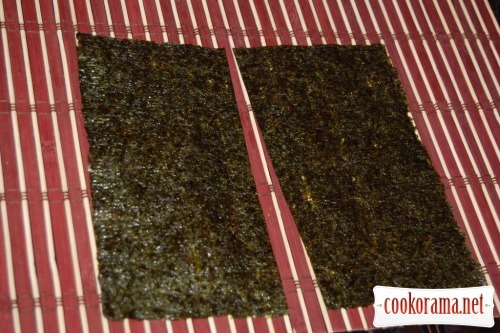 Connect nori with drop of water, if necessary. 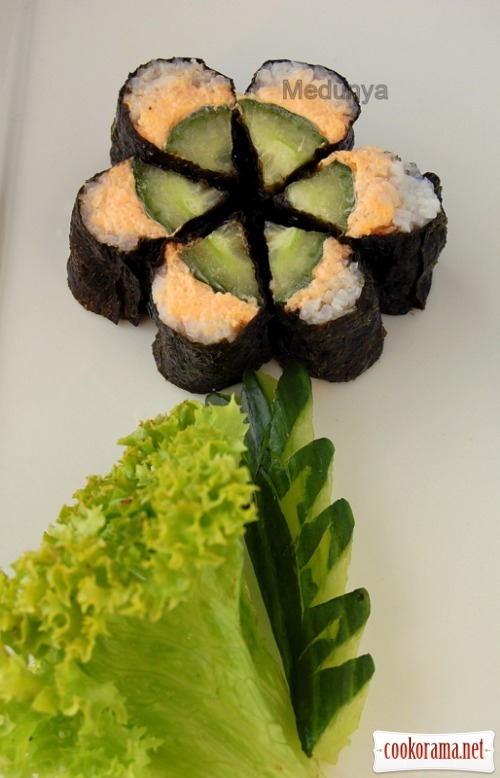 Cut roll in 6 parts with the help of sharp knife, dipped in water with rice vinegar. Spread in shape of flour. 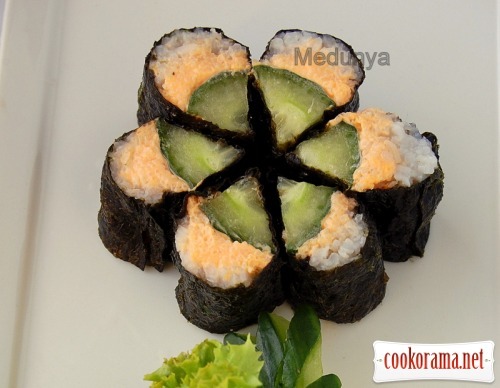 Top of recipe "Sushi with cucumber and smoked capelin caviar "Flower""
Краса! Який творчій підхід до виготовлення суші, японці відпочивають! Гарна квітка вийшла! І мені три пелюстки, будь ласка! Треба ідейку в суші ресторани підкінути! а я суши не ем , но твои бы попробовала!!! Дяки У цих нема сирої риби — можна їсти! Ставлю бал за оригінальну подачу! Recipes, Second course, Sushi with cucumber and smoked capelin caviar "Flower"